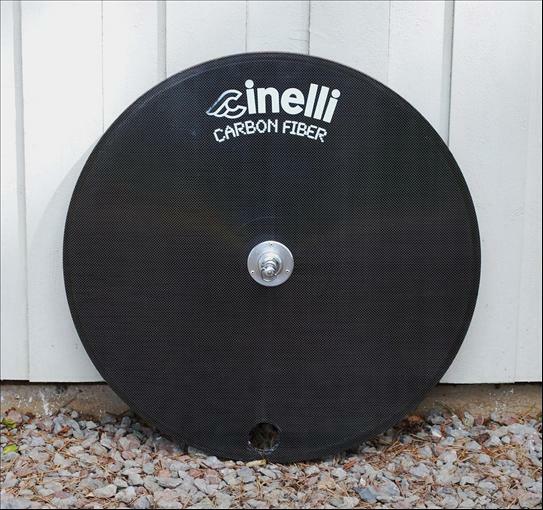 Cinelli carboon fiber disc wheel. Came in 700C rear disc for either road and track and 650C front disc for either road and track. Hubs made by Gipiemme. Hollow disc in contrast to the first resin disc wheel made by Gipiemme/Ambrosio 1984, which was solid. Gipiemme manufactured the Cinelli disc and sold this wheel also under their own name but then painted grey.